Hydrolyzed vegetable protein is a flavour enhancer that's added to processed foods. It can contain up to 30 per cent MSG. 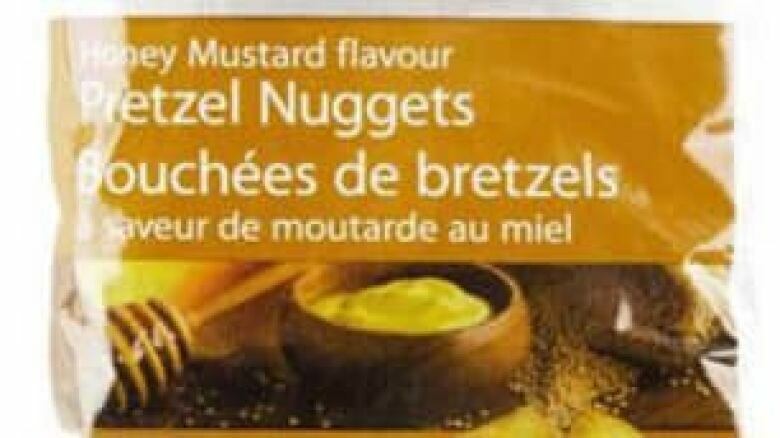 It's also at the centre of a North American-wide recall of processed foods linked to a processing plant in Las Vegas. You're really careful about what you and your family eat, checking product labels religiously for ingredients you don't want entering your body. Yet, no matter what precautions you take, circumstances beyond your control put you at risk. President's Choice pretzels are part of a larger recall over possible salmonella risk. ((CFIA))Over the past couple of years, several outbreaks — including listeriosis, E. coli and salmonella — have sickened thousands of people across the country. The listeriosis outbreak — traced to a Maple Leaf Foods plant in Ontario — was linked to 22 deaths across the country. It led to the recall of 220 products, mainly sandwich meats. But you don't have to eat meat to be at risk from tainted food. The U.S. Food and Drug Administration ran some tests on equipment at the Basics Food Flavor plant in Las Vegas and found traces of salmonella. The equipment might have contaminated an ingredient that's used in a wide variety of food products — hydrolyzed vegetable protein. You'll also find it in some mass-produced vegetarian products made of soy. Hydrolyzed vegetable protein (HVP) is produced by boiling foods such as soy, corn, or wheat in hydrochloric acid and then neutralizing the solution with sodium hydroxide. The acid breaks down the protein in vegetables into their component amino acids. One of the amino acids in the dark-coloured liquid that's left is glutamic acid. Consumers are more familiar with glutamic acid in the form of its sodium salt — monosodium glutamate, or MSG. A similar product — derived from dairy products — is hydrolyzed whey protein. If I'm sensitive to MSG, should I avoid HVP? Yes. MSG is an established headache trigger. Some MSG-intolerant people can develop MSG symptom complex. Besides headaches, its symptoms can include a rapid heart rate, nausea, chest pain and facial pressure or tightness. Even though HVP may contain 10 to 30 per cent MSG, products that contain HVP do not have to be labelled as containing MSG. Product labels have to identify MSG as an ingredient only when it is directly added to food. It does not have to be identified as an ingredient when it is a byproduct of another process. People who are sensitive to MSG should avoid foods containing ingredients or additives that include the word "hydrolyzed." How extensive is the recall? HVP is found in a wide range of processed foods - thousands of products. The FDA's recall — which was initiated on Mar. 4, 2010 — involved all hydrolyzed vegetable protein in powder and paste form produced at the Las Vegas plant since Sept. 17, 2009. The recall started with several chip and vegetable dips. Health Canada added certain potato chips and pretzels to the list. The FDA has posted a searchable database of the products involved in its recall. How do I protect myself from salmonella? Cooking food properly will kill salmonella bacteria. However, ready-to-eat food that has been infected can pose problems. The FDA and Health Canada say — so far — no illnesses have been associated with this recall.